Home / Home / More is More? I am finding the adage, Less is More may or may not apply to illustration. 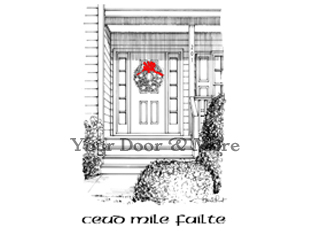 My dear friend and neighbor wanted a card of her front door and sign, stating Ceud Mile Failte which translates to a hundred thousand welcomes, a common greeting phrase in Ireland and the Celtic language. 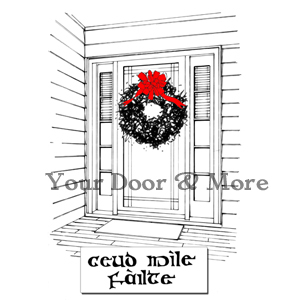 I illustrated the door and I was not satisfied with the end results. It needed more…the second go was a better result. I guess trial and error is the trick!